Bob Solarz, from Philadelphia, with a great Albie catch. Photo credit: Capt. Michael Mauri. I was searching through my pictures trying to find inspiration for this article when I came across one trip that left an imprint back in July. This story is about my client and friend Bob. Bob’s success on the water was pure heart and dedication so it deserves to be shared. Bob is from Philadelphia and he booked his first trip with me in July of 2017. He is now one of my most frequent customers and we have become great friends. He gave me the nickname Captain No Slack and tells others my guiding service is fly fishing boot camp but nonetheless he returns for every season to enjoy the variety of species Stuart has to offer. 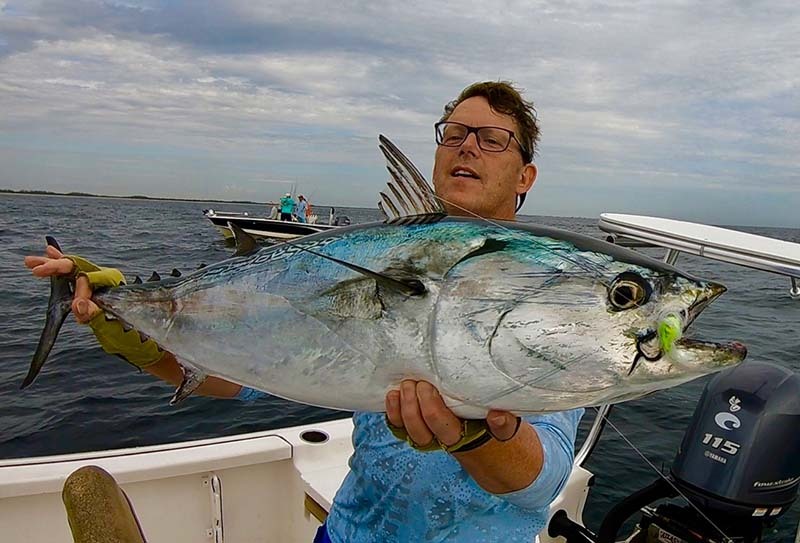 Bob arrived in end July to target the monster ‘”False Albacore” and king mackerel. We fished for three days and had a lot of success and decided we would fish a few hours on the day of his evening departure. I took him to Bullshark Barge a little later than usual in hopes the other boats would be gone. Boy was I wrong! There were boats everywhere. I decided to anchor my boat a little further away from the other boats with my trolling motor. I set Bob up with a sinking line and a 1/0 Clouser. The current was really strong that day with wind and good size waves pushing from the Southeast. It didn’t take long for Bob to hook into a nice size fish. The boat was bouncing up and down in the waves while Bob was playing the fish from the stern casting deck. I was standing next to him when the unthinkable happened. In a split second, Bob lost his balance and fell overboard with his fly rod in hand. I immediately got in position to jump in after him and I see his arm come up with fly rod still in hand followed by his head. He immediately yelled, “Take the rod for me.” I took the rod while he swam to the boat and climbed up the ladder. As if nothing happened he grabbed the rod and landed a nice kingfish. We ended that day with two nice kingfish and few decent size albies. The friendships I make through guiding and memories that enable good fishing stories are part of the reason being a guide is so satisfying. The Fly Fishing Column is written by Capt. Michael Mauri, www.mauriflyfishing.com, [email protected], (772) 485-3321. 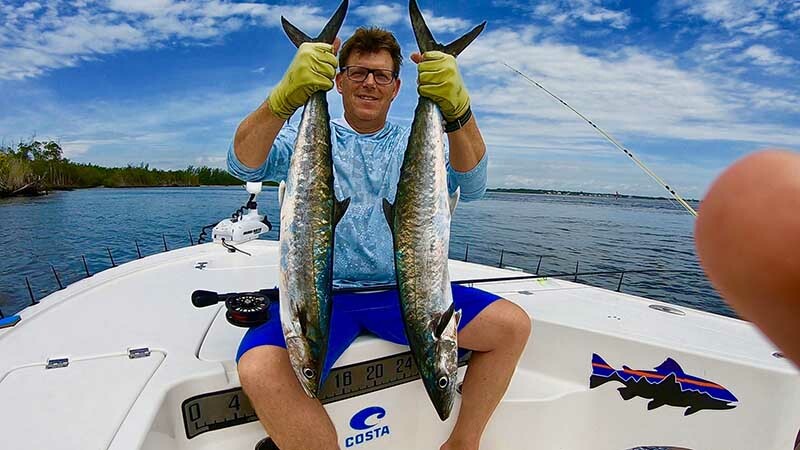 Bob Solarz caught a couple of nice kings fishing with Capt. Michael Mauri, despite falling overboard! Photo credit: Capt. Michael Mauri.